You'll find more than great window coverings at Betz Blinds: Whether you are shopping for a single window treatment, redecorating your entire house or seeking the solution to a complex design challenge, you'll find great people who have the knowledge and expertise to help you put it all together. Betz Blinds was founded in 1997 by Denny Betz. Since we are locally owned and operated, we take our long-term commitment to the community seriously, and we are proud of the professional products and services we provide. We can repair most brands of window coverings quickly and professionally. If you have a broken cord, we replace all the cords in your blind. We have lots of parts on hand. If you can bring in your broken part, it is much easier to find what you need. Would you like an in-home consultation? The staff at Betz Blinds will walk you through all product choices, so you can make a more informed decision for your windows, ensuring your long-term satisfaction with your purchase. Or come visit us in our showroom, it will SAVE YOU TIME when we come to your home to professionally measure your windows and help you pick out your colors. Never settle for less than Betz Blinds. 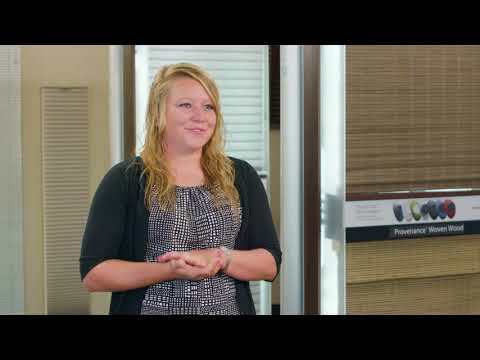 Kim Bertram of Betz Blinds says, "we specialize in custom blinds", and explains how we offer window measuring and installation services. We also offer a warranty for the life of the blinds, and available to repair them if needed! Our team is motivated by pride in customer service, and doing a great job to meet the needs of our homeowners. Need inspiration or a question on an idea? Our showroom is a resource to view the available options, touch and feel all of our products, and consult our professionals on the PowerView® Motorization Operating System that seamlessly integrates with home automations systems.